This week I’ll begin with a TV alert for tonight: Firefly returns, sort of. Unfortunately it is only in reruns on the Science Channel, which starts airing the old episodes which were remastered in high definition at 8:00 tonight. Future episodes following tonight’s rerun of the pilot will be at 10:00. The network will be including science features which are tied into the show. 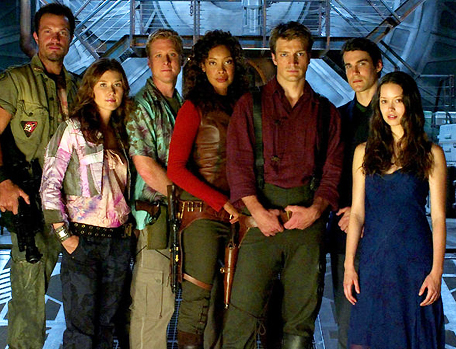 If Castle had its series finale tomorrow and Fox said to you and Joss: “We screwed up, let’s try doing Firefly again.” Would you do it? Yes. Yes. I would examine very closely Fox’s reasoning — I’m a little gun-shy. If I got $300 million from the California Lottery, the first thing I would do is buy the rights to Firefly, make it on my own, and distribute it on the Internet. There’s even been activity by fans to raise the money, but it will take far more than this to get the old cast, not to mention Joss Whedon, together to make this happen. Fans of No Ordinary Family are hoping this show doesn’t die like Firefox and are organizing a campaign to try to save the show. The Cape has already been canceled and NBC isn’t even going to broadcast the last remaining episode. They are planning to stream it on line sometime this month. The Event returns this Monday, with commercials for the episode giving away more than we have learned so far by watching the series. It appears they are finally getting to a storyline which Fringe has already began developing. Many shows are fortunate to be returning, and rare shows have even been renewed for more than one season. CBS recently renewed Big Bang Theory for three seasons. They have now renewed How I Met Your Mother for two more years, giving more time for Ted’s quest to meet his wife more time to play out. True Blood, like many cable shows, doesn’t have the same worries about being discontinued before having a chance to develop an audience. There are now reports that Eric will lose his memory for much of the season. Anna Paquin is also saying there might be a romance between Sookie and Eric extending beyond the previous dream scenes. There’s no word on whether this is while Eric has lost his memory or at some other time.